Target sells plenty of Toys made by Parents Magazine. Most of them are good toys, that kids will actually play with for a long time. 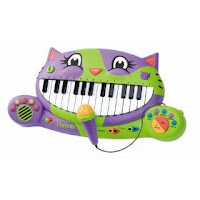 I bought the Kitty Keyboard for my first son and both of my kids still use it. The kids love pretending that they are playing music and they love singing into the microphone. This is a great buy as a gift and a definite MUST HAVE!